K-pop sweetheart Xander was in Singapore recently as part of the crew for tvN’s ‘Wok The World’ series, and GOkpop managed to snag an exclusive interview with the busy star before the shoot for the Singapore leg of the tour began! Q: Hi Xander, before we begin the interview, could you please give a greeting to the GOKPOP readers? A: Hello GOKPOP Singapore! This is Alexander, nice seeing you. Q: How do you feel to be back in Singapore after so long and considering that this is your first trip here for 2019? A: Ah yes, happy new year! I’m always glad to come back here because I love everything about Singapore; clean, nice food, nice people. Always glad to be back! Q: You’ve travelled around with celebrity chefs Alvin Leung and Eric Chong, did you manage to pick up any cooking skills and how would you rate your skills? A: Honestly, they’re too advanced level for me to learn! But when I look at them, instead of learning skills about cooking, I’d say Chef Alvin does a lot of TV shows, so I learned a lot of terms that they use on shows. For example, instead of saying that the sauce is very tasteless/bland, he corrected me by saying that the term to be used should be ‘subtle’. Q: You were recently in Manila and Semarang for tvN’s ‘Wok The World’ shooting, are they any interesting stories you would like to share? A: Interesting…I would say in Semarang, because we didn’t know that there was so much historical stuff over there, so it was fun riding a bicycle but it was really tough! It was interesting and fun. Also, the Manila Chinatown was a very interesting place for us, because it is the oldest Chinatown in the world so it was very special. Q: Could you give some advice to the contestants and/or any aspiring chefs? A: To everyone outside, one thing I’ve really learned from Chef Alvin is to always think outside of the box. It is not just about the taste, cooking is also an art so do try to use your own creativity and make your own version of a dish. Q: Singapore is a country you always visit; are there any secret locations or good food that you would like to recommend? A: There is one location that I was talking about recently; it was a street that was filled with desserts – Liang Seah Street! That was a place I explored actually, I really like desserts and different foods so that was one of the places. So far I’m still exploring, I found Haji Lane very interesting and it’s good at night. I’m still exploring! Q: Now let’s talk about your solo activities; are there any upcoming projects that you’re looking forward to? A: Of course nothing is confirmed yet, it’s going to be focused more on acting but of course I’ll still be doing TV shows. I might come out with music; I never know what I’m going to do because it’s always so random. Q: What are the inspirations for your music styles? A: Music style...it is so random, I don’t really have a music style because I think in the world nowadays everybody is just ‘sometimes I want this, sometimes I want that’ so I’m just going to follow the flow. I don’t really know but no heavy metal for sure, no no! Q: So you’ll be having your meet-and-greet tomorrow, any plans for a meet-and-greet anywhere else? A: Definitely, actually the meet-and-greet tomorrow is just a small-scale event because I didn’t expect to do a meet-and-greet, but there are definitely plans for meet-and-greet sessions in other countries for a later timing. Q: Lastly, could you please give a message to your fans here in Singapore? A: Hi everyone in Singapore, thank you for supporting me up till now! Happy new year, and I definitely wish you all the best this year, the year of the Pig, and also follow me on Twitter and Instagram to stay updated! That’s not all, midway through the shoot for ‘Wok The World’, Xander sat down with the media guests and gave an impromptu group interview! When asked what his favourite local cuisine is, we found out that Xander was not able to pick between the classics – pepper crab, salted egg crab, laksa and chicken rice. Quoting the star, ‘I personally prefer pepper crab over chilli crab, and salted egg crab too!’. He admitted that he is definitely not loyal when it comes to food because there is no way he could decide on one food to eat for the rest of his life. He also revealed that he likes mala more than the usual kind of spiciness that Korean food has because it numbs his tongue, so he gets to enjoy and escape that pain that comes with spicy food! 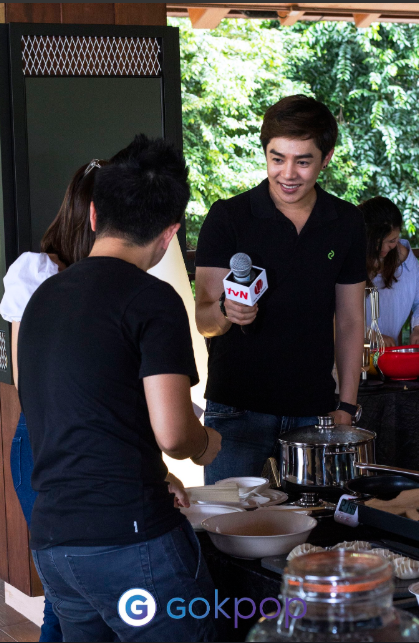 We dived into some personal or lifestyle habits that Xander has, and the star revealed that because he lives alone, he would prefer to eat out instead of ending up with enough food to eat the same dish for 3 days if he attempts to cook. This definitely resonated with the crowd because most of them were seen nodding in agreement or laughing along! To wrap up the interview, Xander revealed that he has been wanting to try either horror or psychopathic killer genres if possible – ‘I can just be myself!’. He also surprised us by revealing that he has actually fallen for the convenience that Singlish brings because it’s one of the languages that allow a long line to be shortened into just 2 words without losing the meaning along the way. We’re definitely looking forward to the next time this bubbly star sets foot on our sunny island again, and until then we’ll be busy checking out the places he recommended during the interview! We would like to thank Alexander Lee for taking the time to do this interview and tvN Asia for the opportunity to be an official media for the show.